﻿ Cleveland - Where the Wild (Orange Trout) Things Are? Cleveland – Where the Wild (Orange Trout) Things Are? Cleveland Ohio’s Rock River Reservation…stunning greenspace in an urban setting! Cleveland, Ohio, happens to be home to one of the most amazing urban park settings I’ve ever set foot in. The compelling draw is the Rocky River Reservation, flowing through the heart of Cleveland near the airport, and emptying into Lake Erie. 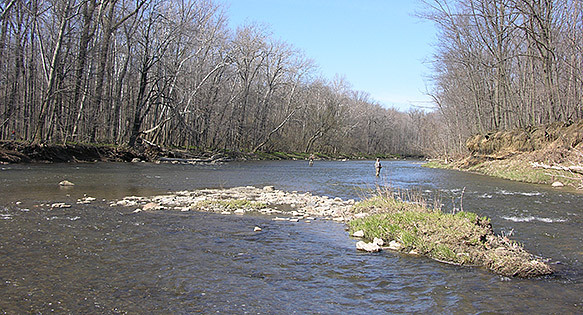 It is home to a world class mixed fishery of both warmwater species (most notably Smallmouth Bass) and non-native coldwater species (a truly top-notch Steelhead, aka. migratory rainbow trout, fishery). Water quality management has definitely helped this area, with potentially ideal headwaters now supporting some natural salmonid reproduction. A long time friend of mine, Mike Durkalec, happens to be the head biologist for the Cleveland Metroparks system, and is routinely out and about on the park’s waters, whether promoting the great urban angling opportunities to citizens, or conducting biological management and monitoring efforts. This of course, sometimes includes a bit of “electrofishing” and other collection methods. At the start of 2014, I even managed to spend a day on frozen water chasing the elusive, xanthic-strain hatchery-produced “Palamino” or “Golden” Rainbow Trout with Durkalec and a few other aquarists and angling friends. I thought this was as close as we’d ever come to seeing a solid orange “steelhead”! 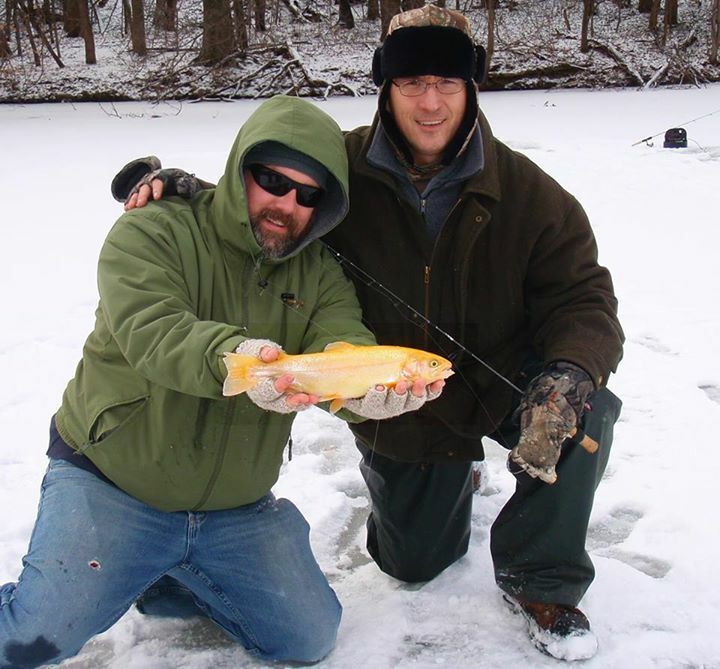 The author (left) and Durkalec (right) show off a mid-winter prize from the Cleveland Metroparks – the “Golden” or “Palamino” Rainbow Trout. However, earlier this week, Durkalec and Metroparks staff spent time sampling the marina area of the lower Rocky River; Durkalec recently noted that while Steelhead normally only entering the river system to spawn before dying or returning to the lake, sampling has revealed the presence of this game fish in the Rocky River at every month of the year, albeit not always in great numbers. This week’s sampling didn’t turn up the typical “rainbow trout” form of Steelhead that Durkalec would have been excited to see this early in the season. However, sampling did in fact turn up some fish Durkalec jokingly referred to as “whiskered steelhead” (catfish) and one amazing, record pushing, “orange steelhead”! Yes…that’s not really a steelhead. Durkalec confirmed the ID we suspected, and elaborated, admonishing aquarists that, “Goldfish belong in bowls and garden ponds, not the natural environment of the Midwest where they compete with our native species. Please don’t release unwanted piscine (or any other) pets, people! I even found 3 alive and well Malawi cichlids in this same river a few summers back.” For those who might ask, this fish was NOT returned to the Rocky River after sampling! We here at AMAZONAS Magazine echo Durkalec’s sentiments wholeheartedly, and remind all aquarists, new or veteran, that disposal of unwanted aquarium fish into the wild is never appropriate and probably illegal as well. For information and helpful guidelines on disposition of unwanted aquatic plants, fish, and invertebrates, visit the Habitattitude website. Check out this Google Image Search for the Rocky River Reservation to see this wonderful park in all the seasons! 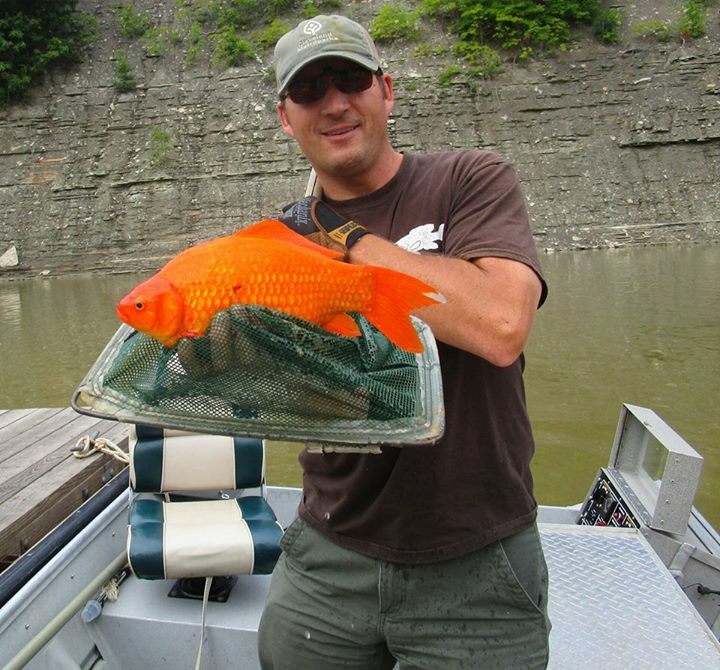 If you enjoy fishing and are interested in the Cleveland Metroparks, be sure to follow the Metroparks Fishing Report, where Durkalec keeps tabs on the lastest angling conditions…and occasional surprise finds.